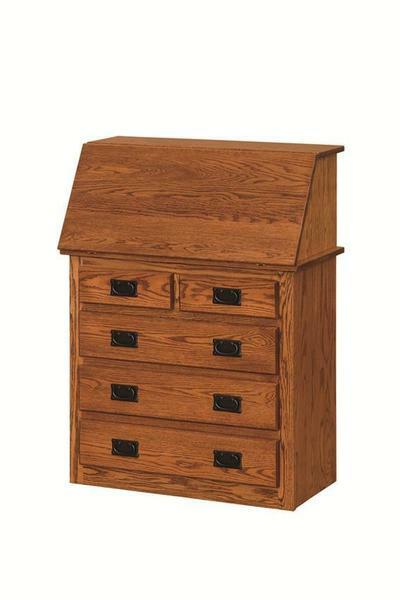 The very versatile Amish Mission Arts and Crafts Secretary Desk with Drawers fits right in throughout your home. For a stylish storage chest with a built in work space, this solid wood desk works well contributing to your decor. Place this mission furniture in your home office, bedroom, hallway, family room or living room and enjoy all the fine features it has to offer. This mission style desk is a handy secretary style, with a flip down opening that opens to a delightful area for your laptop, journal or notepad. Enjoy built in solid wood cubbies as well as the convenience of closing up your desk to conceal any clutter. Five solid wood drawers provide room for photo albums, records, office supplies and more. Three full length drawers and two small storage drawers are all strong dovetailed drawers with full extension drawer slides that allow you to pull the drawer out all the way for maximum use of space. Bring home the version of this Arts and Crafts desk that you like best. Choose from oak, cherry, quarter sawn white oak or brown maple wood and find the stain among our wide variety of stain samples. Choose from our line of quality hardware options and consider adding a lock to secure desk contents. Browse our complete collection of Amish Secretary Desks in all the latest styles.